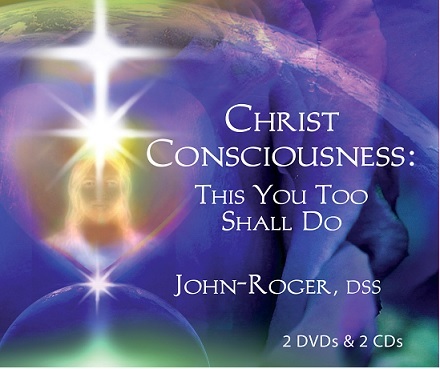 DVD1and CD1 of this packet include excerpts from John-Roger in which he clarifies our relationship with The Christ, and offers ways we can grow to recognize ourselves as parts of that pattern of Being. In it, J-R talks about who Christ is in this day. J-R says, "If Jesus is the historical Jesus Christ we know about, we then have an exampleship that we can start moving our life into. Wouldn't it be neat to live the example of Christ, full of love? Jesus said, 'This that I do, you too shall do.' "
DVD2 and CD2 are bonuses in this packet, containing an interview with J-R in which he answers questions about spiritual life, about MSIA's purpose and teachings, the immutability of spiritual truths, Soul, Heaven, Hell and spaces in between. "We're all commutators of divine energy through us and out into the world...every one of us," J-R says. "God is on all levels," he continues, "and must have a transformer to step the energy of Spirit into this level." That's us.